With the many resources that New Mexico has to offer, it’s no surprise that sunshine is one of the most plentiful. Several New Mexican cities, like Albuquerque and Roswell, are among the sunniest in the nation with our neighbor in Texas, El Paso, being ranked as the six sunniest city in the country! Averaging at over 280 sunny days, the solar energy potential in the Southwest is nearly unmatched. For the next year, the full 30% federal tax credit is available for both residential and commercial solar installations. This incentive makes it even easier for most homeowners to get solar panels installed for less than what they are paying in current utility costs. For homeowners, with a tax liability, the Federal Solar Investment Tax Credit (ITC) is currently a 30% dollar-for-dollar credit available for eligible solar installations and equipment. So, what’s the catch? We’d love to say there isn’t one. But in the coming years, the residential tax credit available for solar projects will drop to 0%. In order to qualify for the full 30% tax credit, solar projects must be installed before the end of 2019. In 2020, the tax credit will decrease to 26% and in 2021, the credit will drop again to 22%. In 2022, the last year of the federal tax credit for residential solar installations, the tax credit will make a final drop to 10% before being extinguished completely. While going solar will still make sense for New Mexicans after 2022, the financial benefits of going solar today are irrefutable. With the 30% federal ITC still available, electricity rates increasing each year and the cost of solar at an all-time low, the time to go solar is now. 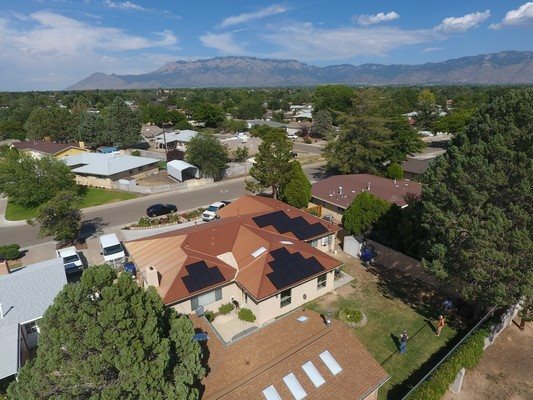 Every homeowner that goes solar helps themselves, the New Mexican economy and the environment. In a state where solar energy is constantly falling from the sky, it makes sense to capitalize on the financial benefits that are available. The 30% tax credit* that is currently available makes it easier than ever for homeowners to do that, by going solar and taking control of their energy costs. Choose to go solar and choose to stay local, contact NM Solar Group today! NM Solar Group is a locally owned and homegrown solar company originally based out of Albuquerque, New Mexico. Founded by Ryan Wallace in 2015, NM Solar Group has helped over 500 homeowners own their own energy with solar. Since then they’ve opened a second office, in Alamogordo, and they are continuously expanding to better serve New Mexico and the surrounding communities. *We are not tax professionals. As such, we recommend consulting a tax representative to learn how the available tax credits could work for your financial circumstances.